I present a selection of designs to be stitched and made into greetings cards for Birthdays, Easter, Mother’s Day and Christmas. A delightful set of cards! Each finished design measures 53 by 79 stitches. If stitched on 16 count aida fabric, the finished measurements will be approximately 4” x 5” (10.5 x 13 cm). Your fabric should measure a minimum of 8” x 9” (20 x 23cm) to give a 2” (5cm) border around the outside. You can then cut the fabric around the design and mount it onto a card of your choice. 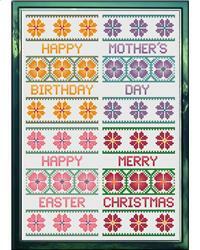 I have designed these to be stitched onto 16 count aida in order to fit onto a 5”x7” greetings card blank. You can, of course, use a different count of fabric, 18 or 14 count, and your finished size will be different and you may need to use a different sized card and cut your fabric larger or smaller depending on your choice. Project Size: 4" x 5"